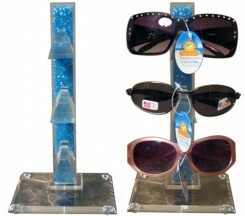 Great Sunglass Racks for Your Store - CTS Wholesale LLC. Do you need a set of sunglass racks to display your sunglasses? If you do, then visit CTS Wholesale Sunglasses today and see the wide variety of racks and display units that we have. These racks will allow you to organize your sunglasses into an appealing display that will draw customers to it and sell the glasses on the spot. If it is organized and and not just hanging out on the countertop, then customers are more likely to stand and look and try on the sunglasses and possibly purchase. Making it convenient for the customer is everything. At CTS Wholesale Sunglasses we are not just sunglasses. We also have lighters, hats and even reading glasses for your customers. Everything is sold by the dozen to give you the very best prices so that you will be able to make a profit in your store or at your event. We are here to help you succeed and have the knowledge and experience to provide you with great selling ideas that really work. From selling at fairs and summer rodeos or within your convenience store we understand the retail business and are here to offer great advice. And the selection we have - it is the tops. From designer women's sunglasses to men's aviator sunglasses and a great selection of kids sunglasses - we have them all. We make sure that we have the brands that people want and the styles that are flying off the shelves. These are not just your old 80's styled sunglasses - they are fun, up to date, and in style for your customers to pick and choose. Displayed on the great racks they will fly out the door. Customers will come back again and again to get a pair because they know that you have the selection to back it up. The display racks are made of heavy duty materials that will stand up to the test of time and can be handled by customers without the fear of breaking. They will look classy in your shop and draw attention. We have countertop, floor models, rotating models, signage to gather interest and traveling models for those fairs and other events. We have you covered when it comes to display and stylish sunglasses. Now it will be your job to get out there and sell your wares. Visit CTS Wholesale Sunglasses today and see for yourself how easy it is to make a profit in eye-wear. Buy now!